Cookistry: Technique: Is it Done Yet? When it comes to proper kneading, we’ve already discussed the windowpane test which shows that a dough has sufficient gluten structure to bake with. While this is a great tool for breads that will be baked the same day, if you’re planning a long cold fermentation you need to take into account that gluten will develop on its own during that long rest. That’s why no-knead bread works so well, and it’s also why dough that’s left to ferment too long becomes unusable as the gluten begins to degrade. For long-fermented doughs, you can assume that the gluten will develop properly during the long rest, and knead – or mix – just long enough to combine your ingredients. Instructions in many bread recipes say that your dough should be shiny and elastic, and it's just what it sounds like. The dough will go from having a dull surface to being shiny, and it will willingly stretch. A dough that has reached this point is just about guaranteed to pass the windowpane test. The instruction to let dough “rise until doubled” seems pretty simple, but judging when a dough is doubled in size is harder than it sounds. Doubled in size refers to the volume of the dough, not the height, and judging volume is tricky. The problem is that the thing you’re looking at probably is growing in width as well as height. You can solve that problem by putting your dough into a container that has straight sides and measuring its rise in the container. There are dough-rising buckets designed specifically for this purpose. But instead of buying yet another container you have to store, you can use something that’s probably already in your house – a standard drinking glass with straight sides. Obviously, your whole batch of dough isn’t going to fit into a drinking glass, but you can tear off a chunk, put it into the glass, measure its height, and make a note of where it should be when it has doubled. 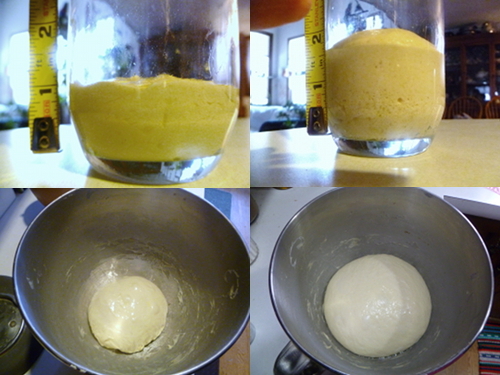 As long as your glass and your main ball of dough are in similar environments, they should rise at the same rate. Here’s where pizza and bread diverge a bit. With (most) pizza, after the first rise, you stretch, top, and bake in a short period of time. With bread, you’re looking for another full rise after you form the loaf and before the bread goes into the oven. When it comes to determining whether your loaf of bread is ready for baking – usually another doubling in size - you might not want to sacrifice even a small blob of dough to that drinking glass. Luckily, there’s another test that’s quite handy: the poke test. The poke test doesn’t actually determine whether the dough has doubled. Instead, it checks the gluten’s readiness. When you first form a ball of dough for baking, it’s very elastic – you push it, and it pushes back. So if you poke the side of your newly-formed loaf with a finger, it will bounce back immediately. Test it again, later, and it will bounce back, but slower. Test still later, and the dent will remain. For most bread doughs, that’s when you want to bake. If you wait too long, the dough can rise too much, to the point where not only does the dent remain, but the bread collapses because there’s not enough structure left to support it. For pizza, it’s pretty obvious when it’s done. Color and crispness are pretty obvious indicators, and the condition of your toppings are also an indicator. With bread, it’s a little different. Crust color is certainly one indication, but crust color isn’t consistent from one bread recipe to another. Additional ingredients – butter, sugar, honey, and alternative flours – all affect the color of the crust. So unless you’ve baked the same bread before, you can’t rely on color alone. Many bread recipes suggest that you thump the bottom of a loaf to see if it sounds hollow. While that’s a decent indicator, you might need to thump a lot of loaves before you can reliably tell if the loaf is hollow (no more wet dough in the center) or whether it needs to bake a little longer. If you’re new at baking bread, you’ll probably spend a lot of time tapping the bottom of your loaf, and still wondering if it’s done or not. Another pre-technology method for determining doneness is to feel how heavy the loaf is. A fully-baked loaf will feel light for its size. Again, this is most useful if you’ve baked the same loaf before. A dense rye bread will feel heavier than a light and fluffy loaf of white bread. The lightness of a baked loaf is more than just an illusion based on the increase in size. I decided to weigh dough as it went into the oven and again when it came out. The dough weighed 547 grams (19.3 ounces) going in and 477 grams (16.8) ounces when it came out. So it lost a total of 70 grams, or about 13 percent of its total weight. Now that we’ve got technology on our side, we can test the temperature of the loaf of bread. Most standard bread recipes are done when the dough reaches an internal temperature of 200-210 degrees. If you don’t want to mar the surface of your beautiful loaf of bread, just turn it over and poke the thermometer in the center. And just like testing a cake, if your bread is done, there shouldn’t be any moist, gummy residue on the thermometer when it comes out. To be honest, there are plenty of times I forget to set a timer for my bread, and I still manage to get it out of the oven in time. Because there’s one more test that has never failed me. About five minutes before the loaf is fully baked, the aroma of baked bread suddenly pervades the air. It’s just about foolproof. When you’re baking bread, it’s like cooking a turkey where you can wiggle the turkey leg and check the color of the juices and look at the thermometer, there are plenty of ways to check for doneness, but the clock is only an estimate. Many bread recipes suggest that you let a loaf of bread cool completely before you begin slicing, and there’s a good reason for it. Just like beef roast, your bread isn’t done cooking when it leaves the oven. Juices are circulating in your roast, and there’s steam trapped inside that loaf of bread. Remember that bread I weighed before and after baking? I weighed it again after it was completely cooled, and in that time it lost another 12 grams. In total, that loaf lost 15 percent of its original weight. A freshly baked loaf of bread is hard to resist, and if you decide to tear into it as soon as it leaves the oven, that’s your call. If the loaf is going to be eaten entirely, it doesn’t matter. But if you’ve baked a loaf that you’re going to be slicing and eating over several days, you might find that the quality is better if you let it cool completely before you make that first slice. This is a great, informational post. One of the scariest things about baking bread to me is the variability in the timing. I will definitely use thus post as a resource in the future to conquer my bread-baking fear. Thank you so much for this blog, especially the pictures!